Engineering Inspiration can prepare and deliver lectures and training to all age groups. For several years Peter Sturgess has lectured on braking system design to both undergraduate and postgraduate students at Loughborough University. He also tutors on the vehicle design modules. We support STEM education and act as mentors for The British Science Association CREST Awards. 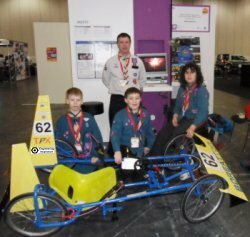 In 2013 a team of Scouts we sponsored qualified for the final of the National Science & Engineering Competition. Engineering Inspiration have also produced a range of customer specific braking system design guides to aid young designers and companies without braking specific engineers. We have also worked with third parties to produce online training material for both design engineers and maintenance staff.